The meta description is often overlooked as a marketing tool for your website. It’s typical that one is written for the home page and then this is duplicated across many other pages on the site. Sometimes, there’s no description at all and search engines choose to include the first sentence of content to fill the gap. 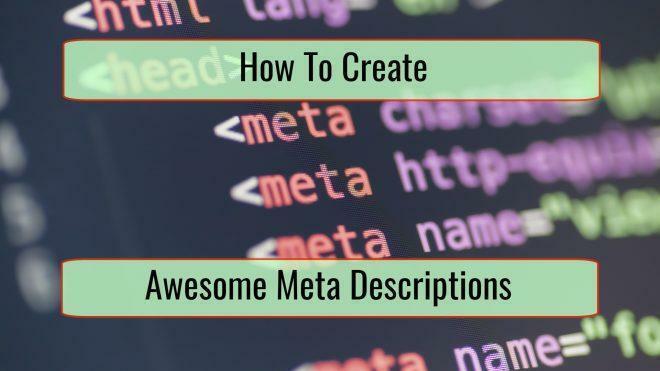 Here we look at what meta descriptions are, why they’re still important and some suggestions for how to create excellent ones for each of your blog posts. A meta description is a way to put down in words what a page or blog post is all about; it’s a page summary. When looking up the page or post in a search engine, it will typically display the title, the page or website URL below that and then the description. When the description is too lengthy – usually longer than 150-160 characters – Google, Bing and other search engines will truncate it. This isn’t ideal as part of what it’s conveying is lost. Therefore, the first rule is to not exceed the recommended length to avoid getting the end chopped off! It’s also referred to occasionally as a meta tag because the description is enclosed in coded tags. The meta is intended to describe the page or post and doesn’t show directly on the page like a paragraph or an image would do. What we mean by this is, it’s a good idea to think about these page summaries as a sales opportunity rather than a computer thing. Because this sentence or two isn’t directly shown on the website, it’s only there to provide an explanation of what the page is about. It’s like a narrative or commentary track on a DVD for a movie; it adds additional background and relevance. From the perspective of the searcher, they may never have visited the site before. They see a site name, a title with a brief idea about what the post will show, but it’s very little to go on. They’re not persuaded yet to click the link in the search results and visit your site. What’s needed is a bit of sizzle… and the meta description does that. While the titles each convey adequately that the articles found on these sites will address the sore muscle problem, more information is better. Which link will you click on? This is where the description comes into play. If the title is the teaser, then the description seals the deal. You must sell what the page has to offer to grab the attention of the potential visitor. Timidity won’t work here. In one or two sentences, readers must be convinced your article will answer their question or solve their problem the best. When creating a description, don’t do it as an afterthought. One idea is to have the original writer assigned to also pen the 150-160-character meta description. They’re researching and writing the article, so they’re well placed to know what it’s about. Doing it this way, it avoids someone getting ready to publish an article and realizing at the last minute that the description hasn’t been written yet. Then they post the article and hastily write up something for the description they hope makes sense. Uninspired for sure! Don’t leave it to chance. While the summary isn’t used to rank sites directly any longer, the improved click-through rate of a well-crafted description is a ranking signal to Google. In other words, they may rank a site higher because your search result is being clicked on more frequently than sites displayed above. Use emotive words. Capture the attention and emotions of the searcher. Use powerful words that say much in a single word. Transform telecommunications. Don’t merely Change telecommunications. It doesn’t matter that the searcher is only reading a few words and grasping your core message. Make them feel strongly that your article, product or service is what they’re looking for. You may not get a second opportunity to do so! If you want the searcher to take an action, don’t be vague about it. Be direct. For an insurance company’s home page, should they talk about how long the business has been operating? Or, do you want to say: “The best insurance coverage with competitive pricing. Get a quote today!”. Which will appeal more to people searching for insurance? Does Your Page/Post Solve a Problem? Will the content solve their problem in some way? There’s a ‘homemade recipe to dazzle your taste buds’ or they can ‘get the lowest airline prices and latest special offers’. Don’t be afraid to tell the searcher how your page or post will help solve their problem. If you do a better job of selling it, they’ll click on it. The meta title displays above both the URL and the description on search pages. It’s the first thing the searcher notices before their eyes move lower down the screen. It’s only 50-60 characters, but it can still punch the air with impact. The title must match the writing style of the description too, otherwise one or the other will seem out of place. When it comes to meta descriptions and titles, invest a little extra time with them. It will pay off in a higher click-through rate and likely more engagement with the brand too. Showing some personality that’s consistent with other marketing or the brand image where appropriate isn’t a bad thing either. Entice the searcher to visit your site. Don’t leave it to chance.